Is Steam login page asking you to upload SSFN file? Think twice before uploading, because the legitimate steam site never asks you to upload SSFN file. Steam Guard is extra layer of security. It will ask you to enter a verification code sent to your email, whenever you try to log in from a computer you haven't used before. This feature will prevent attackers from taking control of your steam account, even if they know your login id and password. 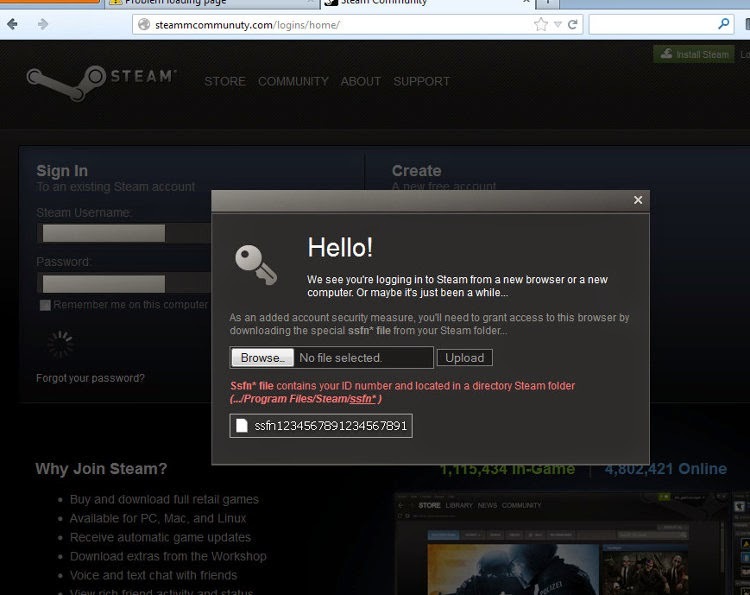 However, there is new Phishing scam uncovered by MalwareBytes that bypasses the Steam Guard protection. It tricks users into handing over their login credentials and the SSFN file. SSFN is the file that avoids you from having to verify your identity through Steam Guard every time you login to Steam on your computer. If an user deletes this file, he will be asked to verify again and new SSFN file will be generated and stored in your pc. If you upload your SSFN file to a phishing page, attackers can use this file with username &password to take control of your account. In a reddit thread, several users have reported that they got fooled by this phishing scam. "Steam will never ask you to provide any Steam Guard files. If you upload or give a user your Steam Guard .SSFN file, they can gain access to your account without accessing your email account. However, they must know your Steam account password and username to use this file" Valve article about Steam Guard reads.